Cheese is one of those magical foods that lends itself to almost any application. It is glorious all on its own. It pairs beautifully with any breadstuff. It sings with the addition of a garnish of everything from savory (herbs, onions, cured meats) to sweet (fruit, jam, thick syrupy vinegars, honey). It is delicious both raw and cooked. And it makes for an amazing ingredient in other dishes. With recent holiday entertaining, food gifting and the like, you might have found your cheese drawer overflowing with an abundance of this wonderful stuff. And while an embarrassment of cheesy riches is as good an excuse as any to gather some people around, you might also be craving a bit of social respite. These hand pies can be made large enough to make a nice lunch, or small enough for a two-bite, cocktail-hour snack. They are delicious hot out of the oven and at room temperature. And they freeze beautifully pre-baking, so that you can make a batch and stash them. The crust is a pastry made mostly with cheese—just a tiny bit of butter to add some flakiness—so it is a terrific way of using up the remnants of a cheese board. You want to use a cheese that is firm, but not overly aged (no parm here), and not too soft (no brie). Think of the consistency of butter right out of the fridge; those are the cheeses you want. Cheddar, gruyere, Comté, all work great here and feel free to mix them up if you have a bunch of small bits lying around. It might be tempting to grab a bag of shredded cheese for this. So, let me say, unequivocally, do not use pre-shredded cheese! The starches coating the shreds to keep them from sticking together will make your crust too dry. In this application, the cheese is subbing in for the usual fats in your pastry, so you want it full-fat and unadulterated. If you like a bit of extra oomph, one of my favorite cheeses for this crust is Cotswold, a cheddar-like cheese with chives that has just the right texture. (I love the little flecks of green and oniony flavor the cheese imparts.) You can also add some chopped chive to the filling if you like. This filling is cheese on cheese on cheese because, well, more is more in the cheese world. But you do you in this business, so feel free to add your own touches like caramelized onion, fig jam, mostarda, spices, herbs, hot pepper jelly—the varieties can be endless. And you can use this recipe, which is enough for a double crust pie, for an amazing apple pie with cheddar crust. And for a great little cheese cracker, roll the dough into one-inch thick logs, roll the logs in everything bagel seasoning, white poppy seeds or a mix of white and black sesame seeds, chill, slice, and bake. For the crust: Pulse the flour and salt in a food processor just to combine. If you like, add a pinch of ground white pepper, espelette, cayenne, or even chili powder to add some heat to your crust. Add the cubed butter and grated cheese to the bowl and pulse to combine. You won’t get the same sandy texture as you would with a butter or shortening crust, but never fear! Drizzle the water over the top of the mixture, then pulse again to combine until the dough comes together. You should be able to pinch the pastry together into a cohesive mass. Dump the pastry onto your counter or a board, and divide into two equal portions, kneading each briefly to bring the dough together and forming into rectangles. Wrap each rectangle in plastic wrap and put in the fridge to rest for a minimum of 30 minutes and up to three days in advance. You can also freeze the dough for future use. When you are ready to make your hand pies, mix the ricotta with the parmesan until smooth. Taste and see how salty the cheese mixture is, then season with salt and pepper to taste. Stir in the mozzarella pearls. Roll the dough between two sheets of parchment to about 1/8-1/16 inch thick rectangles. Peel back the top sheet of parchment, then lay it gently back down and flip the dough over, then peel back the second sheet of parchment. You can use this second sheet to line your baking pan. This ensures that the dough won’t be stuck to the parchment after you cut your shapes. For the least amount of dough waste, and because I am super lazy and hate to have to re-roll dough scraps, I cut the rectangle into squares for triangular pies, but if you want to cut rounds for pretty half-moons, you can re-roll the scraps. 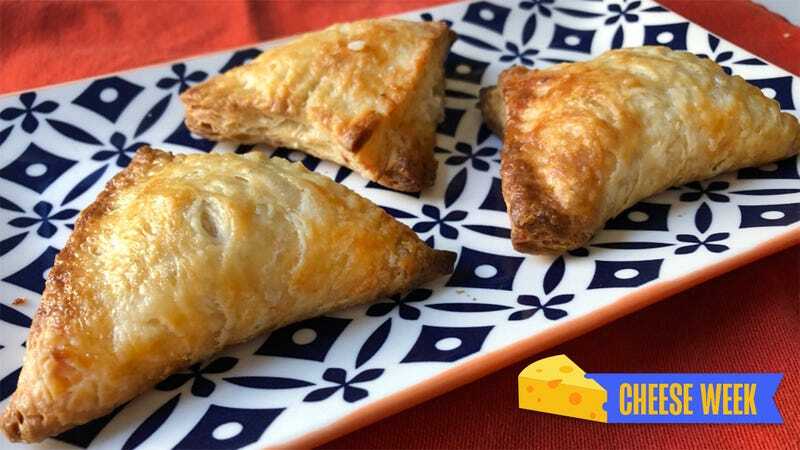 For small appetizer hand pies, make squares about three-inches wide, and for larger pies, up to six inches, and place on the parchment-lined pan. It is easier to fill and form right on the pan so that you don’t have to move them and risk breaking the crust. Fill small pies with about a teaspoon and a half, for larger pies one to two tablespoons. Dip your finger in the egg mixture and run it around the edge of the dough, then fold over the dough to enclose the mixture, pushing out as much air as possible. Using a fork dipped in flour, crimp the edges to seal fully. Make a small slit in the top of each pie for steam to release and paint with the remaining egg wash. If you like you can sprinkle the tops with seeds or more grated cheese or even dried herbs. Bake for about 15 minutes for small ones, up to 22 for large ones, the pies should be golden brown and crisp. Slide a spatula underneath to ensure that the bottoms are browned and crispy, if the bottoms are not done, the dough will be raw in the middle. Let rest on the pan on a rack for 5 minutes before serving. Serve hot or at room temp. If you want to make ahead, re-warm in an oven at 350 degrees Fahrenheit on a rack over a sheet pan for 10-12 minutes.